The first step in a nurturing campaign is to actually get candidate’s email addresses that you will need for the campaign. This can be done in a variety of ways, but for recruiting purposes the talent pool is likely the most effective. A talent pool is a way for potential candidates to stay connected with your company if they don’t see a relevant open position or are not actively looking for a new position. 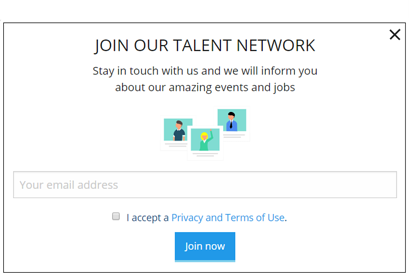 By allowing candidates to sign up for a talent pool, you’ve created a pipeline of potential future candidates that you can nurture and build relationships with. Once you’ve gotten candidate’s to submit their email address, it’s time to send them the first nurturing email. A welcome email is a natural way to create the first touch point. In this email you can include a brief welcome message and link to some related content, for example the most recent blog post or piece of content. Consider making these emails specific to your candidates and target groups. Create the emails in a way that includes a personal touch, such as using their name, or including a reference to their profession or location. After you’ve sent the introduction, the candidate is ready to get to know your company on a deeper level. One easy way to do this is by sharing you social media profiles, like Instagram, Twitter, and Facebook. This is a great way for candidates to see what the day-to-day life is like in your office. While this step is part of the nurturing campaign, it's also something that you should be sending out to your subscribers on a regular basis. Try sending out a newsletter quarterly or monthly, depending on how much content you have to share. Your newsletter can be a combination of various forms of content, such as blog posts, social media posts, events, job postings, and company news. Now is your chance to get to know the candidate on a face-to-face level by inviting them to an event. Not only will they appreciate having a personal touch point, but an event will allow them to see a more tangible side of your company. The event should be specific to your target group. For example, if you are recruiting recent university graduates, it could be a networking event for students. Or, if you are targeting developers, the event could be a hackathon. The most important email to include is the relevant job postings. 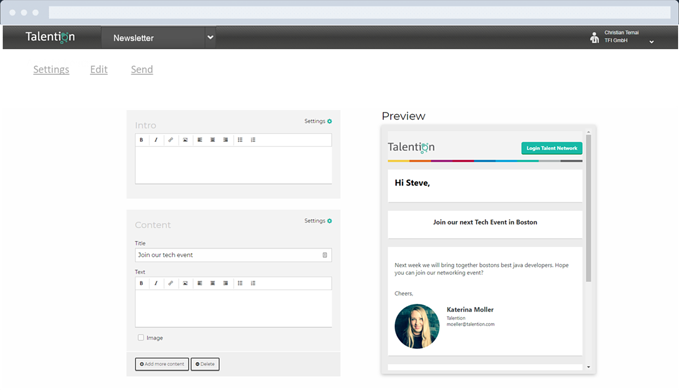 This is where you can turn your potential candidates into applicants. Again, it's important that the open position that you send are target group specific and relevant to that particular candidate. The last step in the campaign comes from the candidate’s side. In an ideal situation, they would then apply for a position at your company. You will be able to measure the effectiveness of your nurturing campaign by the amount of applications you receive in the final step. If you aren’t receiving many applications, it might be time to rethink your previous nurturing emails. Or it could be that your candidates do not fit into your target group and therefore cannot find any relevant positions. In this case, it’s best to start from the beginning and target visitors from your target groups. Check out our page "The Ultimate Guide to Candidate Relationship Management" to find further resources on the topic of candidate relationship management.